This is the view of Mülheim’s Kaiserplatz from the top of the tunnel exit which is under the pedestrian zone at the Kurt Schumacher Platz. The Eppinghofer Strasse, coming from the North, ends here and becomes the Kaiserstrasse if you don’t turn left into the Dickswall. 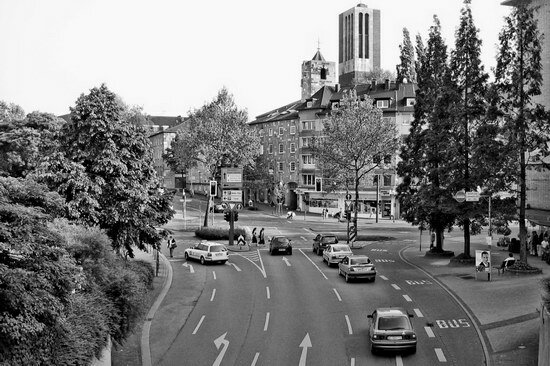 There is no right turn here, only buses are allowed into the Leineweberstrasse because it’s one-way for cars. In the background you can again see the tower of the catholic church, the smaller tower left to it belongs to the church’s community center right beneath it. This photo was taken in May 2004 – I’m sure it still looks the same today!